Report by Nishaptai Nayak, Koraput: Central University of Orissa felicitate four women of the region for their remarkable contribution in the field of women empowerment at it Sunabeda campus on the occasion of International Women’s Day. CUO Vice-Chancellor Prof. Sachidananda Mohanty felicitated them in a special programme organized by the Internal Complaints Committee (ICC) of the University at its campus, Sunabeda. They were Dr. Pritidhara Samal, poet, and Odia Lecture at Govt. Women’s College, Koraput, Dr. Sarala Behera, poet and Teacher at Aeronautics Govt. High School, Sunabeda, Dr. C. Savitri, Principal Vikram Dev (Autonomous) College, Jeypore and Smt. Raimati Ghiuria, Tribal women leader and social worker for their contribution in women’s empowerment in this region. 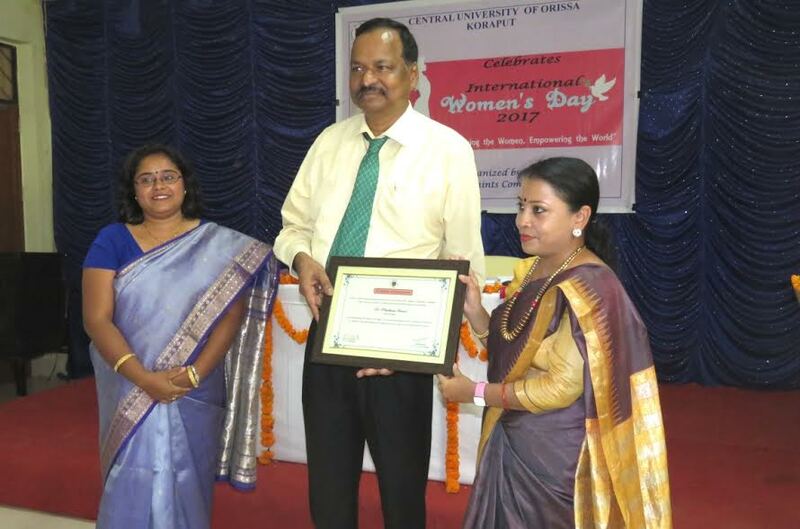 Prof. Mohanty in his inaugural speech hailed the contribution of women in everyone’s life. He advocates the equal rights and position of women in the society. He said “Men and Women are fellow travelers and we need to understand each other. There must be mutual understanding between men and women. We need have mutual understanding rather than the battle of sexes. We need to change our self from the egoism”. “Education system should believe in reformation system and its education which can transform us, changes us and recognize us” said Prof. Mohanty. He shared extract from Sarala Devi and Bidyut Prabha Devi, the renowned Odia poet on this occasion. On this occasion Dr. Pritidhara Samal said “present day’s women are trying to create a new society, where men and women will appreciate each other and men are helping them in it”. Dr. Sarala Behera said “women always have a unique identity and they need to maintain it”. Dr. C. Savitri said” we need to create a society where women will be accepted and supported with a broad mentality”. Smt. Raimati Ghiuria shared her experience and stressed on the economical development of the women for their empowerment. On this occasion guests recited their poems and motivated the students to create a gender equal society. 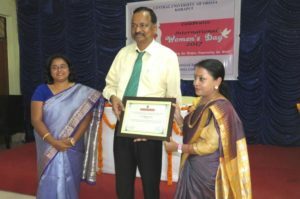 Posters on women empowerment prepared by ICC were inaugurated and prizes and certificates were distributed to the winners of various competition organized by the Internal Complaints Committee (ICC) by Prof. Mohanty. Poetry was recited by the students on this occasion. Dr. Minati Sahoo, Chairperson, ICC delivered the welcome address and Dr. Sagarika Mishra, Member, ICC gave vote of thanks. Dr. Rudrani Mohanty and Dr. Satabdhi Behera, members of ICC, co-ordinate the programme. Sushree Sukanya and Sushree Pratima Sahoo compeered the programme. Students, faculty members and Officers of the University were present at large on this occasion.